Welcome to the New Moon Art Gallery! Art Shows... We invite you to attend one of our acclaimed Spokane juried art shows, where we feature original work by some of the top artists living in the Inland Northwest ~ when you join our mailing list you'll receive a special invitation to the openings! For the most up-to-date news about our gallery, go to our... FACEBOOK Page! ​The New Moon Art Gallery is a Spokane art gallery where emerging and established Spokane artists feature their unique and whimsical contemporary works. Everyone who loves original art and handmade craft is invited to regularly stop by our online gallery and our Facebook page for details about our participating artists, plus you'll find the latest news about invitational shows, special events, artist openings, and workshops. It's also part of our mission to share our artistic abilities with the Spokane community through our Moon Gallery Art Parties and our popular Art Classes. Our gallery is set in the revitalized East Sprague district, in a red brick building with a kaleidoscope of original fine art and artisan craft. We are conveniently located at the corner of East Sprague Avenue & Perry Street, with plenty parking ... click for a MAP to our door! We invite you to join our Moon Gallery mailing list ~ you'll receive special RSVP invitations to our exclusive once-a-month show openings where you can preview the art and meet the artists! Click to.. . JOIN NOW! Meet Our New Moon Art Gallery Artists! Truly unique gifts are available right here in Spokane! Our Moon Gallery Gift Certificates makes it easy to get a gift for that someone in your life who cherishes unique & original handmade work ~ click HERE for the details! ​News Flash!! The Moon has been named a "Top 10 Shopping Showcase" in Spokane! at the corner of Perry Street, just 5 minutes from downtown Spokane. Note to all our previous customers ... 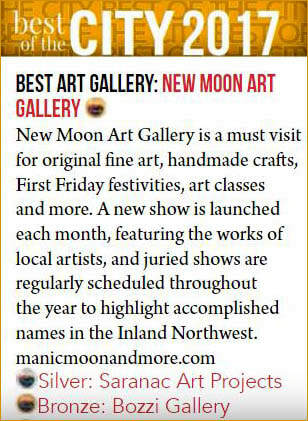 The New Moon Art Gallery was formerly known as "Manic Moon & More"! Original Art Gallery & Handmade Gift Shop! The Moon is easy to find ~ here is a [MAP] to our door! Our gallery features original art & our gift shop features handmade craft ... all created by Spokane area artisans!